SCRAP Entertainment Inc. has partnered with Aksys Games to develop a themed escape room based on the popular Zero Escape video games. Fans and newcomers alike will experience the excitement of a story-based puzzle game come to life when it opens on April 15. This is our first licensed escape room in the US, and we could have not chosen a better partner. 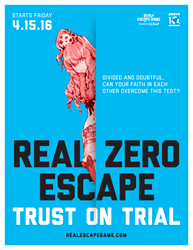 Launching this April in their Little Tokyo location, "Real Zero Escape: Trust on Trial" is an all-new and officially licensed escape room based on a popular series of puzzle games developed by Spike Chunsoft for Nintendo 3DS and PlayStation Vita. "Real Zero Escape" brings the virtual world into reality as players are actually locked inside a room and given a limited time to find a way out. The project is the result of a collaboration between the originators of the escape game genre, SCRAP Entertainment, and Los Angeles-based video game publisher, Aksys Games. With the third installation of the Zero Escape video games arriving this summer, the timing was right for an escape room tie-in, according to Real Escape Game producer, Doc Preuss. "This is our first licensed escape room in the US, and we could have not chosen a better partner," Preuss said. "The games' content lines up perfectly with the kinds of experiences we build for our own players. Many of our staff are huge fans of the series, so this really is a dream collaboration for us." Established in Japan in 2007, SCRAP Corp. debuted the Real Escape Game concept in Kyoto and followed up with the first permanent Real Escape Room in 2010. Since then, over one million people have participated in games run by SCRAP and its partners throughout Japan, China, Singapore, France, Spain, Canada and the United States.